Going Mobile with Mobile Optimised Websites is one of the most pressing issues any business with online presence faces today. Statistics show that more than 60% of people these days use a mobile device to search on Google. That number is growing at a speed 8 times faster than we saw in the 90’s with the usage of computers. An even more staggering statistic is that less than 2% websites today are optimised for mobile usage! Mobile users are more than ever impatient when it comes to finding what they want on their mobile device. They want it here and now, with the least effort possible and to the point. 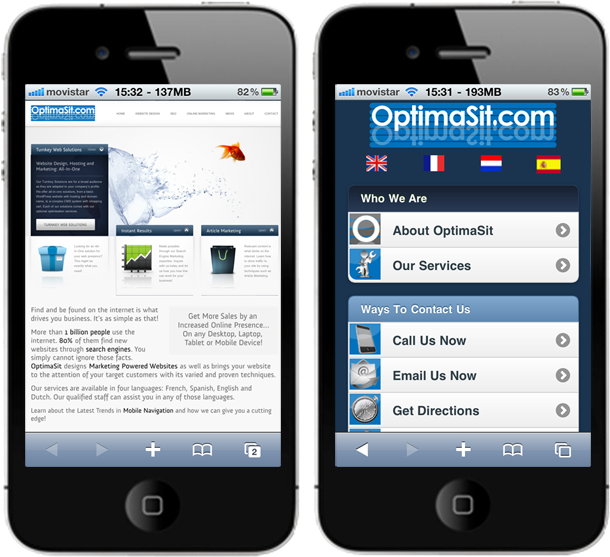 A Mobile Optimised Website is just that. And with less than 2% of your competitors having one, it gives you a cutting edge! Combine this with the latest Google initiative to promote your Mobile Site and arrive on Page One of any Mobile Device Search, increasing your sales with a much lower cost as ever before. This is a great answer on how to tackle the current crisis!